Tyrannosaurus (tyrant lizard) was one of the largest predatory dinosaurs to walk the Earth, and one of the most popular dinosaurs known. Discovered in 1900 by Barnum Brown, it’s most prominent features, along with it’s small, two-fingered hands, is a five-foot long skull, filled with banana-shaped teeth, which are often compared to railroad spikes. It’s large skull, wielding such powerful teeth showed that Tyrannosaurus was most likely the top predator in it’s ecosystem. Tyrannosaurus, styled after The Lost World male. 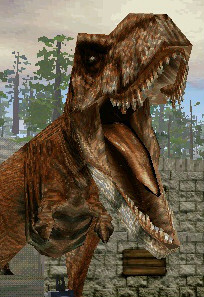 Three types of Tyrannosaurus appear in Trespasser: one which resembles the male from The Lost World: Jurassic Park, one which is orange with black stripes, and one which is black and red. The Tyrannosaurus is first encountered in the end of the riverbed in the Industrial Jungle. 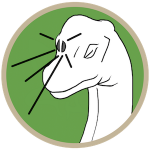 In The Town the player will encounter one inside of the town, as well as witnessing a pair of tyrannosaurs fighting over a Parasaurolophus. They might kill each other, or pursue the player depending on the AI. The player is able to avoid them, though. Two more will be encounter in the Harbor. One fighting a Triceratops, and one fighting a Stegosaurus. The last T. rex, the black and red one, can be found in Ascent 1, at the end of the Mayan village. 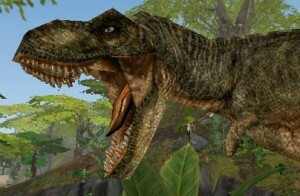 Tyrannosaurus that appears in The Ascent: Part 1. There is a seventh animal. This individual, however, is floating in the sky of Ascent 1, and can not be seen from the ground. It is only accessable though cheats.